For men who want to reduce visible signs of aging in the face but aren't ready to commit to surgery, BOTOX and filler injections offer an effective, minimally invasive option. A few lines here and there on your face can help you look refined and mature—but there’s a limit. When deep brow furrows, hollowing temples, and creases around the nose and mouth reach a certain point, they can make you look haggard. The good news is that you have many convenient options to correct undesirable effects of aging without surgery. Injectable treatments, such as BOTOX® Cosmetic, dermal fillers, and Kybella™ can help you reduce facial lines, restore facial volume, transform your jawline, and take several years off your appearance with little to no downtime. Aging affects men and women differently. Men are usually most concerned about deep brow furrows, hollowing features, and fine lines caused by sun damage. Rarely is the goal to eradicate all wrinkles, just to lessen their prominence. Cosmetic surgeon Dr. Alex Sobel understands these important differences and adjusts his injection technique to achieve noticeable improvements while preserving your naturally masculine features. At Anderson Sobel Cosmetic Surgery, Dr. Sobel performs all injectable treatments personally. Certified by the American Board of Cosmetic Surgery, he has the in-depth cosmetic surgery training, skillful precision, and knowledge of facial anatomy necessary to deliver safe, effective injectable treatments and subtle, natural-looking results. If others mistake you for being angry or worried, even when you feel great, expression lines around the brow and eyes could be to blame. The effects of aging can leave deepening furrows along the brow and stark “frown lines” between the eyes, even when your face is relaxed. BOTOX Cosmetic is an injectable neurotoxin that blocks nerve impulses to the muscles responsible for expression lines, helping to soften their appearance. The effects of BOTOX take about 2 to 14 days to set in, and then will last for up to 4 months. Repeating treatment can help you maintain your results. BOTOX’s nerve impulse-blocking properties also make it a great option for reducing excessive sweating in the hands, armpits or other areas. A series of injections can help you stop sweating in the treatment area for up to 6 months by stopping the “activate” message from your brain to your sweat glands. 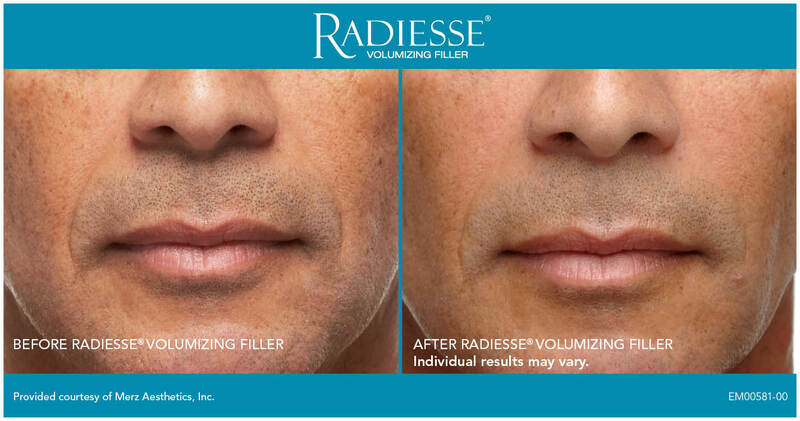 One of our most popular injectables for men isn’t a filler or wrinkle treatment at all. 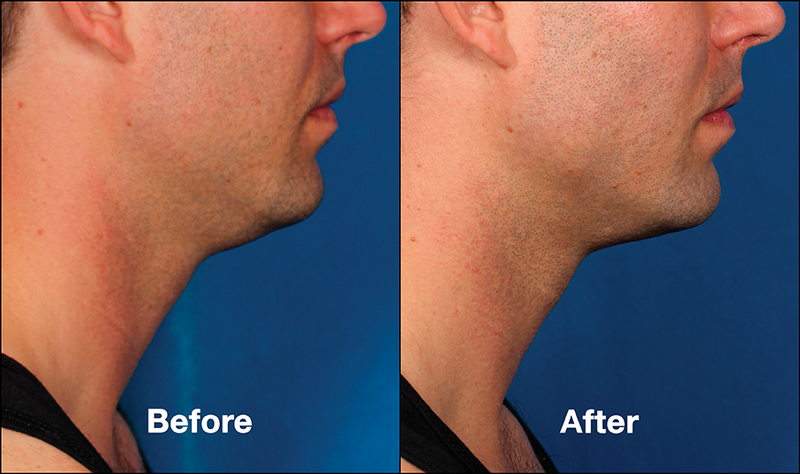 Kybella™ is the first FDA approved injectable that reduces excess fat beneath the chin. A full “double chin” is a very common concern among men, and since this trait is often inherited, losing weight often doesn’t help enough. Kybella is made from deoxycholic acid, a substance that dissolves fat cells when injected directly into the fat pad beneath the chin. Following treatment, your body gradually metabolizes the affected fat cells, helping the chin become leaner over time. Kybella can be an excellent, non-surgical option to refine and strengthen the jawline. Injections take less than 30 minutes to perform, and most patients are satisfied with final results after 2 to 4 treatments. Results will last as long as you maintain a stable weight. Interested to learn more about non-surgical options to refresh your look? We’ll make sure your questions are answered during a private, free consultation with cosmetic surgeon Dr. Alex Sobel.